We all know that wool and silk fibers are the most common for area rugs, along with synthetic fibers like olefin and polypropylene. But what about the other “fancy fibers” out there? Ruthie here with Arizona Oriental & Specialty Rug Care and I thought I would take a moment today to discuss the various area rug fibers available to consumers. Are they a good idea? Are they a smart choice for your home? Read on! First you have your faux silk fibers. The most common faux silk fibers on the market are mercerized cotton and viscose. Mercerized cotton is a cotton yarn that has been put through chemical processes to increase the luster of the yarn. Mercerized cotton is sometimes mistaken for silk because of the super soft feeling of the fiber as well as the shine that it has. Viscose is actually a rayon fiber that used to be called “artificial silk” back before the 1920s. Today, some manufacturers blend viscose with a low-end silk and put “made with silk” on the label. This can be confusing for consumers and even the salesperson, who may not realize what viscose really is. There is also a variety of designer rugs on the market as well. These can be made from a variety of things. I have even seen designer rugs that are made from strips of leather woven together. Some shag rugs can be a problem as well – between clumps of wool to fibers so thick and plush that they grab and hold onto every little thing. The biggest problem for these “fancy fibers” is that manufacturers don’t always take how these fibers will wear over time into consideration. They also don’t think about how, at some point, these area rugs will have to be cleaned. For rugs made out of strips of leather, cleaning them professionally can be extremely difficult. 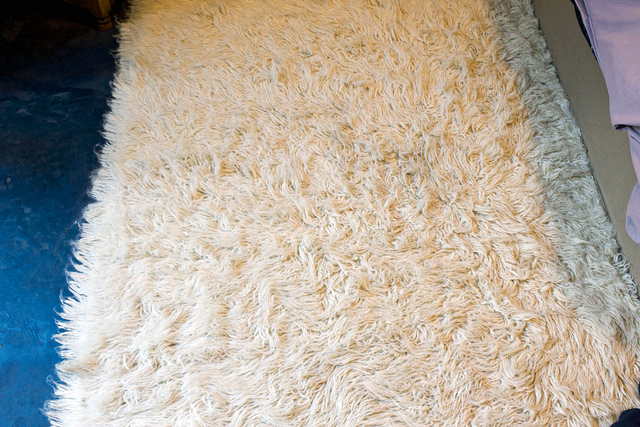 It’s not like a wool or synthetic rug and it takes a lot more work to properly clean! Viscose and mercerized cotton in particular are low performance fibers, meaning that they wear faster and can flatten out like pancakes. They also attract soil like crazy, and it shows! These fibers have trouble releasing stains and that’s bad news when it comes to cleaning. My advice to my readers is this – take care when you purchase a rug for your home that is manufactured with a fancy fiber. We here at Arizona Oriental always want our clients to make informed decisions about everything from what kind of rug they purchase to how to spot clean their rugs when the inevitable accident happens! If you have a question about your rug, give us a call today! Arizona Oriental & Specialty Rug Care serves Prescott Valley, Prescott, Sedona and much of the Northern Arizona areas. We meet the highest standards in professional cleaning of area rugs with rug wash specialists having earned the highest training which includes certification as WOOLSAFE FIBRE CARE SPECIALISTS through the WOOLSAFE ORGANISATION. Such extraordinary certification ensures the area rugs of our client’s receive the utmost in care.